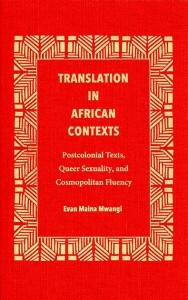 Author Evan Maina Mwangi explores the intersection of translation, sexuality, and cosmopolitan ethics in African literature. Usually seen as the preserve of literature published by Euro-American metro­politan outlets for Western consumption, cultural translation is also a recurrent theme in postcolonial African texts produced primarily for local circulation and sometimes in African languages. Mwangi illustrates how such texts allude to various forms of translation to depict the ethical relations to foreigners and the powerless, including sexual minorities. He also explains the popularity of fluent models of translation in African literature, regardless of the energetic critique of such models by Western-based postcolonial theorists. While bringing to the foreground texts that have received little critical attention in African literary studies, Translation in African Contexts engages a wide range of foundational and postcolonial translation theorists. It considers a rich variety of works, including East African translations of Shakespeare, writings by Ngũgĩ wa Thiong’o and Gakaara wa Wanjaũ, a popular novel by Charles Mangua, and a stage adaptation by the Tanzanian playwright Amandina Lihamba, among others. AuthorEvan Maina Mwangi is associate professor of English and comparative literature at Northwestern University in Evanston, Illinois. Fluent in English, Kiswahili, Gĩkũyũ, and Sheng, among other languages, he is the author of Africa Writes Back to Self: Metafiction, Gender, Sexuality.